Photo of Anahita Azrahimi’s Vogue II – B & W by Nick Coombe. ART: The Gladstone’s Art Bar hosts an opening reception for Iranian artist Anahita Azrahimi’s new exhibit tonight. Littering the frame with magazine cut outs of clothing and body parts, Azrahimi creates an absorbing flow of colour and feeling in a small space of paint-swiped canvas. 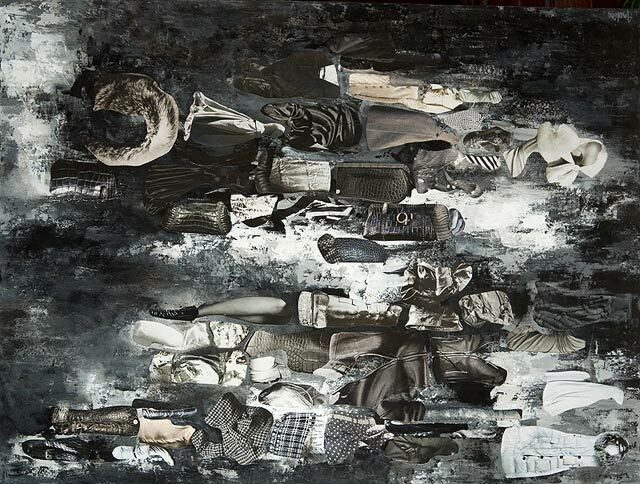 The show’s title, “Mashup,” speaks to the jumble of objects that surface in her paintings, but the synthesis is far more coherent and evocative than the name suggests. Gladstone Hotel (1214 Queen Street West), 7 p.m., FREE. MUSIC: The national music rag Exclaim! has hit its late teens. To celebrate its seventeenth, Exclaim! is hosting a tour with the cover kids of its latest issue: Thunderheist. The electro dance duo has garnered fame with its amazing live act and gratuitous trash talking. So far, the tour has visited most of Canada—Vancouver, Edmonton, Winnipeg, Ottawa, and Montreal—but after the Toronto show, the gig heads to the East Coast. Catch ’em while you can. The Phoenix (410 Sherbourne Street), 10 p.m., $16 in advance at Rotate This and Soundscapes. CYCLING: It’s springtime and bicycles are everywhere. But at the Victory Café tonight, you’ll meet the hard-core cyclists who biked through the slush, rain, hail, and snow of our longest season. This is the Toronto Cyclists Union’s monthly Cinq à Sept meeting happening on the last Thursday of every month. The meeting is more like an informal gathering for bike enthusiasts to gab about future projects or get to know each other. Everybody is welcome (assuming you don’t show up in a Hummer). Victory Café (581 Markham Street), 5–7 p.m., FREE. MUSIC: After a long hiatus, hopping between Rancho Relaxo and Tiger Bar, and finally coming to rest at Wrongbar, the pop music night No Shame is back. Organizer and promoter extraordinaire Lauren Schreiber has excellent taste in homegrown tunes, often resulting in that rare Toronto happening: public dancing! Tonight is the CD release of Guelph band Green Go‘s Borders (reviewed in the latest edition of Sound Advice), along with fellow Guelphites The Magic and Toronto’s Everything All the Time. Wrongbar (1279 Queen Street West), 9 p.m., $5.